Becoming Cultured. | In Florence. A Firenze. Last Wednesday, I spent the evening listening to the snazzily dressed guy in the photo above. The said guy, is a man named Bill Emmott, who has done a whole host of things, but is perhaps most well-known for his position as Editor of The Economist. He didn’t just happen to be in Florence, but was giving a lecture at The British Institute on ‘Europe After Brexit.’ This was also followed by a screening of his most recent film, ‘The Great European Disaster Movie,’ which he helped director Annalisa Piras produce. What can’t this guy do? I’m going to be honest and put my hands up and say, I know zilch about economics. This is no exaggeration. You can see how I was a little taken aback when I actually understood what Mr Emmott was talking about. Understood may be an exaggeration, but I could definitely follow the outline of his argument. I love how accessible he made something as complicated as economics. Not just economics, but the economics behind a political event. Brexit has been a topic very close to home to me. I voted in Edinburgh, where I’d been living for the past year, amongst students from across the globe. Not one person I knew voted leave, and a significant majority of the city’s voting population similarly voted to remain. Many of these people, whom I now consider friends, may be adversely impacted by this decision. I’m not trying to get deep and political, but simply show how relevant this talk was. I think its relevance helped me comprehend the subject, but it was also Emmott’s calm, clear and engaging demeanour. He gestured a lot too, which always makes things easier. 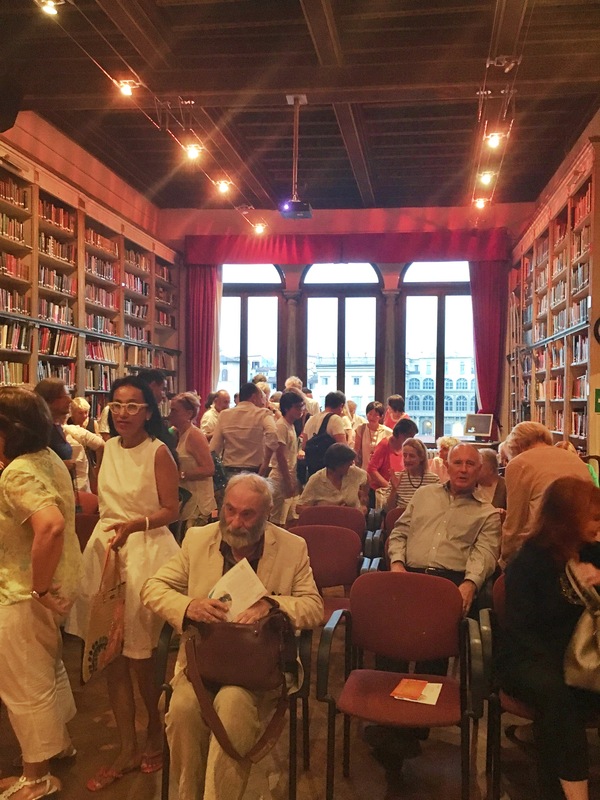 The Harold Acton Library, where the lecture took place, was packed. Everyone listened intently to what he had to say. Afterwards, there was a Q&A with some clearly well-planned questions – I stayed quiet for this bit. The room cleared slightly in between the lecture and the film, but there was still a great atmosphere; the library is a unique setting for a cinema but it really works! In the coming weeks, there will be showings of Bernardo Bertolucci’s films, which are definitely more up my street. Although, it’s always interesting to learn about something completely new, with entirely fresh eyes. If you’re lucky enough to live in Florence and fancy coming along to events like this, the B. I. F. holds a lecture and film screening ever Wednesday evening (Autumn 2016). If you’d like to know more, why not check out their Events page for more details.